Vanilla cookies, vanilla perfume, and everything vanilla swept through my nostrils at a scented display at last year’s Orchid Show. The sweet smell was a great way to show many visitors that vanilla comes from the fruits of the vanilla orchid (Vanilla planifolia). What are the scribbles about? Orchid pods are dated to estimate how long the pods have been on the vine, possibly to determine a good time to harvest them. As a docent at last year’s show, I was eager to show off the Garden’s vanilla plant (located in the Tropical Greenhouse next to the banana trees), because I knew that may visitors didn’t know that they had an orchid in their spice cabinet. 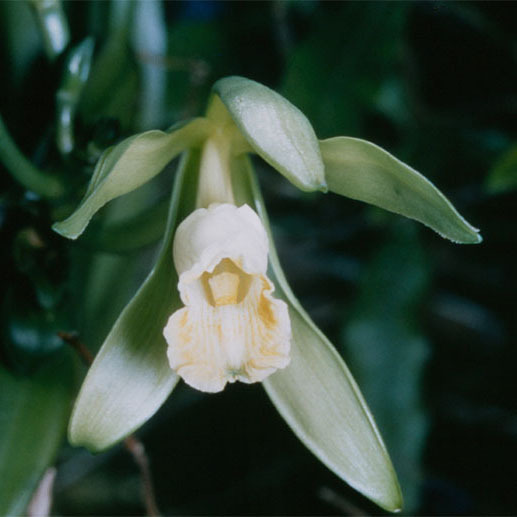 Currently, I am in the second year of my research of the vanilla orchid. Vanilla is an exciting plant to study because it grows as a vine with two different types of roots. These roots help vanilla grow as a vine (more precisely a hemiepiphyte) because terrestrial roots anchor it within the soil, and epiphytic roots anchor it to tree trunks. My last post, Vanilla inhabitants: The search for associated bacteria and fungi, showcased my ongoing experiment in Mexico. This included collecting roots from four different Mexican farms that had very different practices for how they grew the orchid. We know that vanilla orchids use their epiphytic roots for support, but what other functions do they perform? Do they also form symbiotic relationships with fungal partners to obtain nutrients and water, like terrestrial roots? 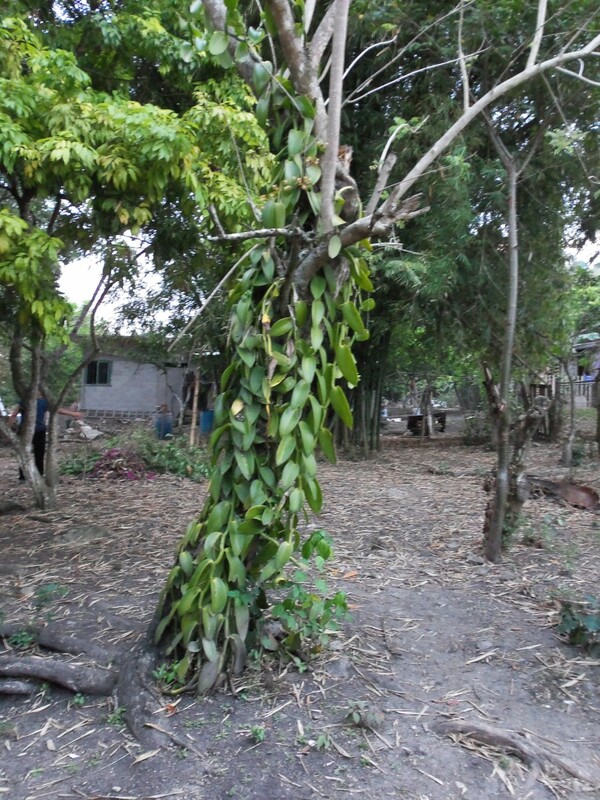 Monocultures—crops with genetically identical heritage—are common in vanilla cultivation. 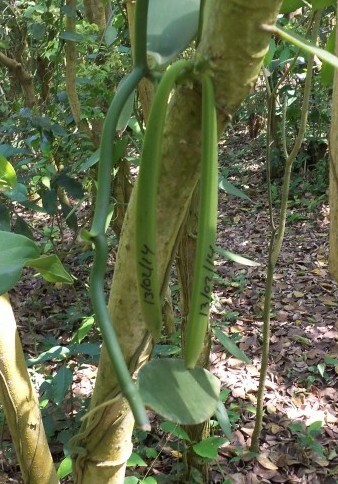 Many vanilla plantations use man-made structures for the vining orchids. Here, an old tree provides support to this orchid. The fungal partners of orchids, known as mycorrhizal fungi, help an orchid start its life by providing needed nutrients for its seeds to germinate. No orchids in the wild can germinate without one or more mycorrhizal fungi. As a scientist, my goal is to study the interactions that the vanilla orchid has with these fungi as they mature. This is important because most vanilla farms are monocultures—it is easier to obtain clones from cuttings of vanilla than to germinate them from seeds. This, however, creates serious problems, because farms that have low genetic diversity in their vanilla orchids can lose their entire crop if a disease (such as root rot caused by Fusarium) appears. Prior reports based on classic techniques have documented two or three species of mycorrhizal fungi within vanilla roots. In addition to these mycorrhizal fungi, there are also fungal pathogens (fungi that cause disease) and fungal endophytes (fungi that seem to have a mutualistic relationship with the host) that colonize a vanilla’s root. To further investigate the situation, I ran an experiment using the latest DNA technology—Next Generation Sequencing (NGS)—to document the communities of fungi within terrestrial and epiphytic vanilla roots. As fungal endophytes take up nutrients from their host, the mycotoxins they produce reduce herbivory and susceptibility to pathogens. 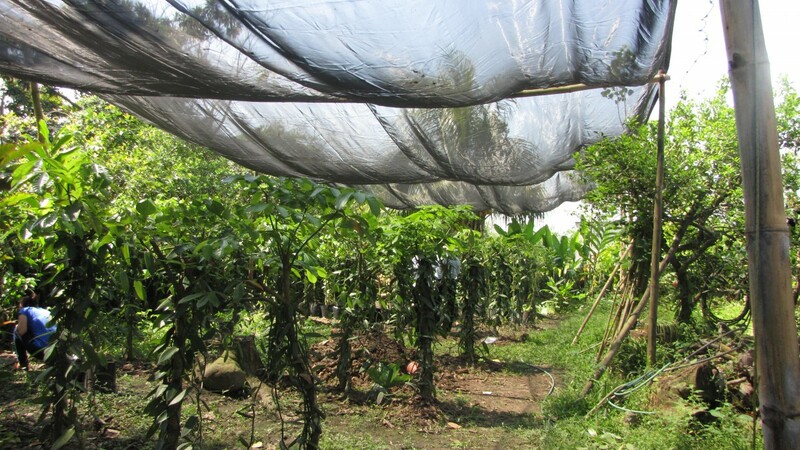 A length of canopies shields the growing vanilla orchids from harsh direct sunlight. I documented 142 species of fungi associated with vanilla roots from the four Mexican farms, with an average of nine fungi colonizing a single vanilla root at one time. Of these 142 species, 20 are likely mycorrhizal. I find that fascinating, because these mycorrhizal fungi were found within both root types and across all farms. It was also surprising to know that epiphytic roots have a similar diversity of mycorrhizal fungi as terrestrial roots even though the epiphytic roots were green and could photosynthesize and have been considered primarily as support structures. My study also documented a high number of previously unreported species of fungal pathogens and fungal endophytes colonized the roots of vanilla plants. This means that if plants are unhealthy, fungal pathogens likely can quickly take over, because they are already present within the roots. Overall, vanilla roots have good and bad partners just like we do, but contain more beneficial fungi (fungal endophytes and mycorrhizal fungi) than previously believed. These beneficial fungi not only supply the plant with water and nutrients, but also help control fungal pathogens. Thus, they are essential for plant health. This research is funded with support from Mexican collaborators as part of the SAGARPA-CONACYT-SNITT 2012-04-190442 Mexican Vanilla Project. Learn more about the orchids in your kitchen cabinet with our Vanilla Infographic; read up on another edible orchid in A Sip of Salep. Stay tuned for more orchid research projects, amazing orchid displays, and fun facts on our blog. The Orchid Show opens February 13!